While most of the world may think of the beaver as a small animal that likes to build dams, the portion of the world's populace that plays backgammon seriously thinks of the beaver as a rule option that allows punishment of an especially unwarranted double. But while the beaver rule option is commonly employed today, not much has been written concerning "beaver theory." This article is an attempt to partially rectify this deplorable lack of information. The beaver rule option allows the player accepting a double to retain possession of the doubling cube and again immediately double the stake played for by "beavering" the double. Thus, if player A doubles player B to a level of 2 on the cube, player B has the option of "beavering" to a level of 4 on the cube and still retain its possession for later normal use. Player B accomplishes the beaver by turning the cube to 4 and saying, "I beaver your double." Player A has the right, as in any doubling situation, to drop the beaver and lose only the doubled stake of two points, or player A can accept the beaver and play on at a stake of four points with player B owning the cube. Or player A can even "raccoon" the beaver to a stake of eight points with player B still owning the cube, if the "raccoon" rule option is being played. The raccoon rule option must be agreed upon prior to commencement of play, and is an opportunity for the original doubler to double the beaver. It should be kept in mind that the beaver rule is optional and that the players should decide upon its use prior to commencement of play. It should also be noted that the beaver rule option is not commonly available for use in tournament play. This is understandable since tournament play is geared for attracting the less skillful player by limiting the number of games played. By doing this the skill of the expert diminishes in importance, in accordance with the brevity of the match, due to the inherent "luck" in the game. Since the use of the beaver rule option would tend to favor the player most skillful in assessing a position for doubling purposes, it may be thought that beavers would discourage the less skillful player from tournament play. Paradoxically, the expert may also dislike the beaver rule option because of the larger point swings that may result from its use, which might also tend to shorten the match in favor of the less skillful player. Outside of tournament play, however, it would stand to reason that the beaver rule option favors the more skillful player, and the greater the skill of the player, the more likely will be the use of the beaver. As was mentioned above, it is permissable for a player to drop a beaver. Illustrative of an example in which the correct reaction to a beaver is a drop is Diagram 1. If Black doubles and White beavers, should Black accept? Black, with men on the nineteen and twenty-one points, doubles White, with men on the four and one points. White beavers, and it's correct for Black to drop this beaver. Black will lose more on the average by accepting the beaver instead of dropping. Naturally it is psychologically very difficult to drop a beaver, since that would imply that an error of judgment had been made with the original double. It stands to reason that one would want to beaver those positions in which one is the favorite to win the position. In other words, one's opponent has badly misjudged the position and has incorrectly doubled in a position in which the doubler stands to lose the position more times than he stands to win. An example of this type of mistake in judgment by the doubler is shown in Diagram 2. Black, with three men on the twenty-four point and three men on the twenty-two point doubles White, with five men on the one point. White should beaver Black's double, since White will win this position 52.25% of the time. In Phillip Martyn on Backgammon, page 143, Martyn states that ". . . it would be idiotic to beaver," in reference to the position in Diagram 2. This simply shows how even the greatest players can be deceived by a position. By accepting the cube, White has become the favorite in the position, due to White's newly acquired ability to force Black to drop an appropriate double. For instance, if Black immediately rolls a combination containing the number 2, White should double and Black should drop. Does one always have to be a favorite to win the position in order for a beaver to be correct? No! It can be correct to beaver a double even if one is less than a 50% favorite to win the position. This is exemplified by the position in Diagram 3. Black, with men on the nineteen and twenty-four points doubles White, with men on the three and two points. White corectly beavers even though White will win only 21/36 × 25/36 = 40.51% of the time. The beaver is correct because of White's power to increase the stakes in a position favorable to White. If the position were played 1296 times, White would be plus 192 points if White beavered Black's double, but White would be plus only 96 points if White merely accepted Black's double. Thus, White increases his equity by beavering. Another example of an ending in which one can be less than a 50% favorite to win the position and yet it be correct to beaver a double is shown in Diagram 4. Black, with two men on the twenty-two point doubles White, with a man on the six point. White correctly beavers even though White is only 19/36 × 27/36 = 39.58% to win the position if Black accepts White's redouble. White's beaver is again correct because of White's power to increase the stakes in a favorable position, or because of White's power to force Black to drop a redouble. If the position were played 1296 times, White would be plus 288 points if White beavered, but White would be plus only 144 points if White merely accepted Black's double. One last example to illustrate the fact that it can be correct to beaver a double even if one is less than a 50% favorite to win is the position in Diagram 5. This more complicated ending has Black, with three men on the twenty-four point and two men on the twenty-three point, doubling White, with men on the six point, five point, and two point. White correctly beavers even though White wins the position only 46.81% of the time. If the position were played 1,679,616 times, White would be plus 4,032 points if White beavers Black's double, but White would be plus 2,016 points if White has merely accepted Black's double. This example is shown to illustrate that beavers can be correct in the more complicated ending where one is less than a 50% favorite. These concrete, mathematically analyzed endings have been chosen to illustrate the point that one need not be a favorite to win the position in order for a beaver to be correct theoretically. 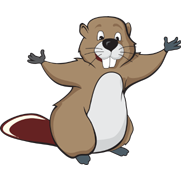 In fact, as has been shown, a beaver can be correct when one is less than a 40% favorite to win a position. What really is salient in considering a beaver is not whether one will win the position 50% or more of the time, but instead whether one will win 50% or more of the points that a position can generate. If one is a favorite to win more than 50% of the points a position can generate, then one should beaver a double, even if one is less than a 50% favorite to win the position. Of course, in the great majority of situations calling for a beaver, one will not be able to precisely analyze the situation mathematically. In this instance it may be helpful to think of the figure 40% as a guide to beavering a double, just as one thinks of 25% or 20% as a guide to accepting a double. Naturally, there is a difference between theoretical and practical backgammon. Playing the beaver rule option tends to produce larger swings of points from one game to another. Therefore, it might behoove an expert, who overall may have a great advantage over a less skillful opponent, to refrain from beavering certain doubles in which the expert may obtain only a very small advantage. By refraining from beavering, it would enable the expert's skill to demonstrate itself over a greater number of games, and thus tend to reduce the luck element of the game. On the other hand, between evenly matched players a beaver may produce practical psychological results, in the form of very timid future cube play by one's opponent if the beaver should prove successful. Or even better, a successful beaver may induce one's opponent to begin steaming away. At any rate, beavers tend to produce alterations in the game rhythm of one's opponent, and this tends to favor the player who has successfully beavered.